Welcome to the third part of my tutorial on how to create a map app for Android from scratch and –>without<– using Google™ APIs :P.
Okay, as I said earlier the TilesManager will provide us with calculations needed to get the right tiles and render them in the right place. TilesManager will have some state variables: position in degrees (longitude & latitude) plus a zoom level. where zoom is the zoom level stored in the tile manager. 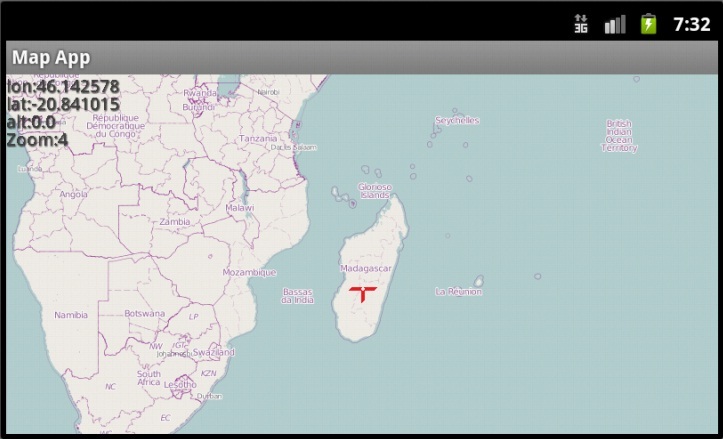 Displaying a map stored in a database on the SDcard, in other words : offline* map, no internet connection is required (but easy to implement online functionality). User can touch control the map (Panning), zoom in\out using volume keys. A marker will be displayed on the map depending on the user’s GPS position. as mentioned before : we’re not going to use Google™ APIs. As you can see the app will be simple, other more complex functions can be added later. Q: Why not use Google™ maps APIs (eg: MapActivity)? A: it requires a working internet connection. A: you might want to write your own classes. A: you might want to know how things work. Q: Aren’t there free map apps on the Android Market? A: Yes there are and they are really good ones, Locus Free, RMaps, Orux Maps, these apps can run with both online and offline modes, I mainly use Locus Free, but I like writing my own apps and learn new things. Here’s the source code (Eclipse Project) and the apk file, after you install it on your device\emulator, copy this map file world.sqlitedb to your /sdcard/mapapp/ (You’ll need to make the folder yourself). Hello there, sorry for being inactive lately but I don’t feel like programming or learning something new :(. Anyway, I fixed the issue in FuchsGUI where some text was blurry, the reason was that the text was being rendered with floating point values for position, something like (20.3f,29.4), this meant that spriteBatch should split physical pixels :(.